Northern Tablelands MP Adam Marshall, left, pictured with General Manager of the NSW Teacher Housing Authority (THA) Philip Shelly, Moree teacher Lauren Barsby, Moree Secondary Executive Principal Dennis Armstrong, THA board member Debbie Marten and Moree teachers Joey Dickerson and Beatrice Torrens at the official opening of teachers accommodation in Moree last week. 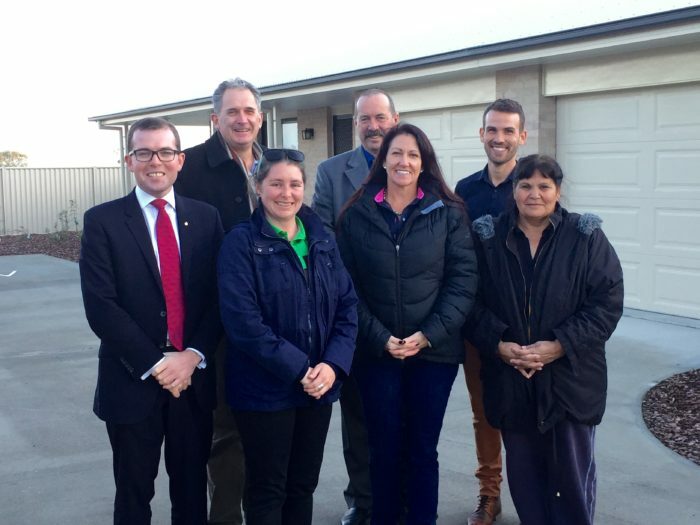 MEMBER for the Northern Tablelands Adam Marshall last week officially opened six new one bedroom units to provide temporary accommodation for new teachers in Moree. Mr Marshall said the units had been purpose-built to accommodate teachers during their first year of teaching in an unfamiliar town. “They are completely furnished and offer a home away from home, providing comfort, security and a warm welcome to Moree in both Blueberry Road and Ameroo Drive,” Mr Marshall said. “The new housing is part of an ongoing commitment by the State Government to attract and retain teachers in regional and rural areas across the state. Mr Marshall said since the government was elected in 2011 more than $15 million has been invested in the bush for housing teachers. “This is a boost for local businesses, while providing and maintaining a vital service to schools in areas of the state where the private rental market is difficult,” he said. Moree Secondary College Executive Principal Denis Armstrong said the current 45 teacher housing residences in Moree were highly valued by local schools and the local community. “When trying to attract teachers to Moree having these modern units and accommodation in town really does help,” he said. M&K construction Group Pty Ltd were awarded the $1.3 million project, using local trades and suppliers as much as possible in the course of construction.